Fig. 1—A forming-limit diagram provides severity bands, the height of the bands on the major strain axis and the location of the measured strain point. • Can the trigger be predicted in advance of actual failure? Obtaining such early data would allow identification of stampings that exceed the forming limit and tear. Corrections then can be implemented before building the physical die. The first paper describing the research results was presented at the 1965 SAE International Congress in Detroit. Over the years the FLD has undergone many improvements, some being forced by demands of new technology and others created by continued research. The initial research program employed a hemispherical punch to stretch clamped flat blanks etched with circular grids. 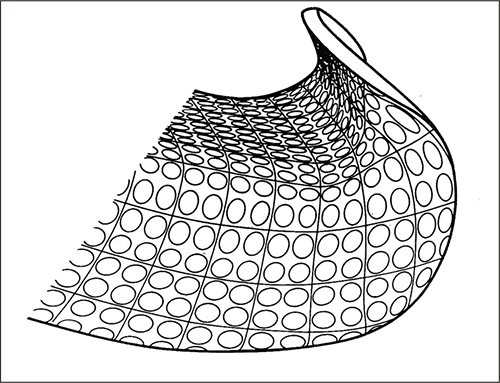 A surface neck in the formed dome was deemed the onset of failure. Different materials and strengths, hemispherical-punch diameters and other variations were tested. Analyzing the data showed that sheetmetal with the same mechanical properties had the same failure trigger. The most conclusive research tests took blanks from the same coil and etched them with circle grids. Some were tested in the lab with a 4-in.-dia. hemispherical punch, their failure strains measured. Other blanks were taken to a press shop, where stamped parts experienced tears. Both samples exhibited the same amount of strain at the failure trigger; the lab test could predict the failure of a stamped part. Fig. 2—Circle grids can be measured for major and minor strains, strain direction, and strain gradients. The FLD evolved from a large quantity of test data (Fig. 1). The upper curve, called the forming-limit curve (FLC), positions vertically on the Y axis by the FLC0—an equation primarily based on the workhardening exponent (n-value). Circle-gridded stampings (Fig. 2) show the magnitude and direction of strain. 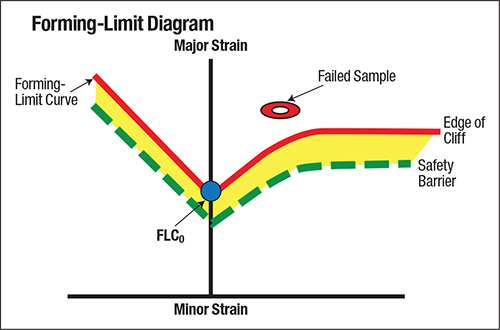 Strain values plotted on the FLD are given a severity rating. Early on, metalformers used the FLD to troubleshoot new stampings and dies. After FLDs became common, metalforming companies began to use them as part of a certification process. When installing a new die, the steel supplier would visit the stamper and bring along its circle-gridding equipment. Together they would grid, form and measure test blanks, and plot test data on the FLD. The press shop required a “green” severity rating before the new die and steel could be released for production. The most important application for FLDs started in the 1980s and ’90s. Virtual forming had arrived. Here the physical forming of a stamping is duplicated in the computer. During the virtual-forming analyses, software evaluates several stampings over several days. Output provides the strain magnitude and direction, information previously obtained by the circle-grid analysis. The missing piece of virtual data was the severity of stamping, able to be obtained using the FLD. Fig. 3—The start of the local neck (A) represents the start of the red severity zone for that sheetmetal blank. Around the world, FLD research has continued. Among the goals of this research: address complaints that plotting the strain path on the FLD (Fig. 1) was incorrect for many nonlinear applications. Deeper research has revealed that using stress instead of strain for the Y axis is a more accurate approach. This modification fits well into virtual-forming programs and is now in use. One challenge not yet solved, even after 50 years, is how to measure the start of the red zone (Fig. 3). Near the end of the stress-strain curve is the start of the local (through-thickness) neck. Once the local neck starts thinning, tensile load drops, deformation on either side of the local neck stops and overall deformation is terminated. The red-zone line represents the onset of the local neck.